Made from a state-of-the-art, lightweight olefin, Retrofit Kits give you a more economical, yet still high-performance version of the CradleGrid ™system for your safe or cabinet. 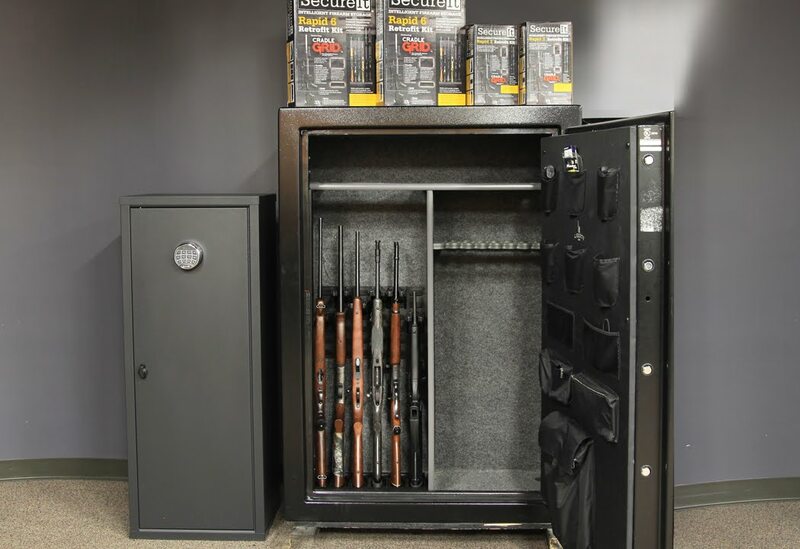 Retrofit any safe or locking cabinet to properly store any combination of 6 modern sporting rifles, firearms, and traditional long guns. Can be used for home defense firearms in a closet in your bedroom or in a locked kitchen cupboard. Just installed the Rapid 6 in a secured cupboard. The lightweight panels and bases were ideal, since I didn’t want excess weight. Brilliant! Received and installed this kit about 2 weeks ago. Such a simple system which invokes the “why didn’t I think of that” response. Easy to install (once you get holes drilled), it was amazing how much neater and better looking my firearms/safe looked once the kit was installed. The price was reasonable and has greatly improved access to each of my long guns. I would STRONGLY recommend this kit to anyone that has more then a couple of weapons in their gun safe. Installed the Rapid 6 in my Canon safe and discovered I needed the Rapid 2, don’t know what I was thinking. Now I have 8 rifles organized instead of the shelving mess that came with the safe. I got these on Black Friday special. My opinion is that discount is about what these should cost. It’s a brilliant and effective solution to gun storage but it’s still plastic and a bungee cord. Way overpriced for what it physically is but it fits my needs perfectly. Clearly, well thought by the designer. Tom that’s exactly what I ended up doing shortly after my review. Great minds think alike. I didn’t want to, but cutting a notch out of the left corner base plate worked like a charm. I turned it upside down and used the plastic skeleton as my guide. I will send photos of the notch cut out as well as photos of my magnets hot glued to the back of the grids where the rifles now rest. I don’t plan on hanging anything heavy like a pistol or bins holding heavy items but I will try as an experiment to see how well the magnets and glue I used hold up to the task. I wanted the flexibility of moving them around an fine tuning so thats why I chose to glue the magnets instead of velcro for example. They are pretty strong so I think they will hold just fine. If anyone is curious what Stack On cabinet I retro fitted this for it is the GCB-8RTA 8 gun which has one shelf in the top. I had purchased it from Amazon. Have you ever thought about making a model 47 type gun storage for an auto mobile say maybe a SUV or sedan for travel. Can you make this model of gun stores to be 50 state compliant? We offer both the Fast Box 40 and 47 for either under the bed use or mobile application. Each side is pre-drilled so that it may be bolted down. 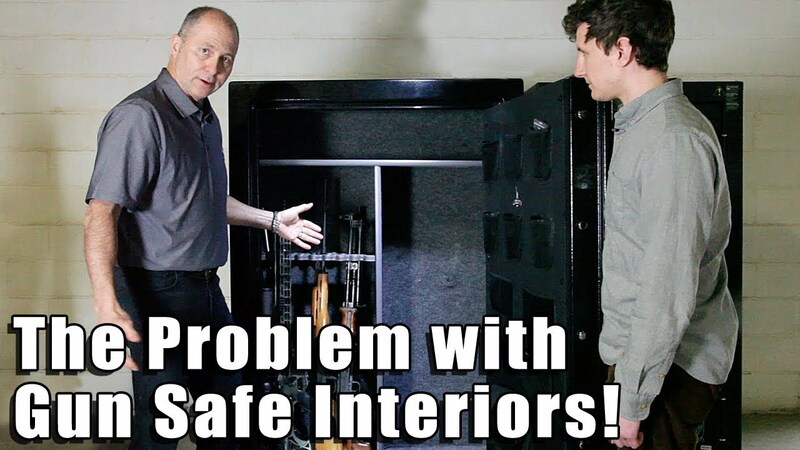 https://www.secureitgunstorage.com/product-category/sporting/hidden-gun-safes/. If you have any other questions please email support@secureittactical.com. Thank you! I had high expectations for this system with its cost. I have a smaller, older safe and used the provided “Snapskru” Togglers, nearly all of which stripped out of the drywall panels, making a complete mess. It could be the age of the panels in my safe, or the togglers were still too long after cutting the guide points on the togglers as instructed. Word of advice, if you have a carpet lined safe, get self adhesive Velcro hook to attach to the back of the wall plates. I’ll be changing mine out with Velcro to correct the deboggle. SecureIt should consider providing Velcro with its Retrofit Kits. One of my rifles has an optic that measures +4.75” (at its tallest point) from the top of the rail – I would like to be able to store the rifle with the optic closest to the back wall of my safe – will this work with the retrofit6 – is there enough clearance? Unfortunately, it would have to be positioned in the stock base in an unusual way. It is not something we suggest. However, anyone from support would be happy to help you figure out the best option. Please email support@secureittactical.com for more info. Thank you! It depends on the size of the cabinet. We suggest taking measurements of the height, width, and depth of the inside of your cabinet. If it is smaller than 17″ wide and 10″ deep these products will fit inside your cabinet. The length is dependant on how tall your cabinet is. It will most likely fit if it is taller than 12″. Thank you!